The knee joint is stabilized primarily by four very strong ligaments. Three of them, the anterior cruciate ligament, the posterior cruciate ligament, and the medial collateral ligament, connect the end of the femur (thigh bone) to the top of the tibia (shin bone). The lateral collateral ligament actually connects the end of the femur to the top of the fibula, which is a much smaller bone in the shin. The fibula and tibia are connected to each other by very strong bindings, so the effect of the lateral collateral ligament is to control the motion between the femur and tibia, just like the other three ligaments that connect these bones directly to each other. The medial collateral ligament (MCL) is located outside of the joint space and on the inner aspect of the knee. Likewise, the lateral collateral ligament (LCL) is located outside of the joint and on the outer aspect of the knee. The two cruciate ligaments are located in the center of the knee joint itself. These cross each other, hence the name “cruciate.” The insertion of these ligaments onto the tibia is such that the anterior cruciate ligament (ACL) inserts on the anterior (front) aspect of the top of the tibia and the posterior cruciate ligament (PCL) inserts on the posterior (back) aspect of the top of the tibia. The end of the femur being round and the top of the tibia being relatively flat, there is very little intrinsic stability imparted by the bony architecture. Rather, the stability of the knee is fundamentally dependent upon the ligamentous structures. Disruption of these ligaments can lead to instability of the knee joint. The degree of instability depends on the number of ligaments that have been injured and their capacity to heal. The medial collateral ligament and the lateral collateral ligament do have significant capacity to heal after injury. Therefore, isolated injuries to these ligaments can often be treated by bracing and activity modification and rehabilitation. Once the ligaments have healed, normal activity can be resumed. 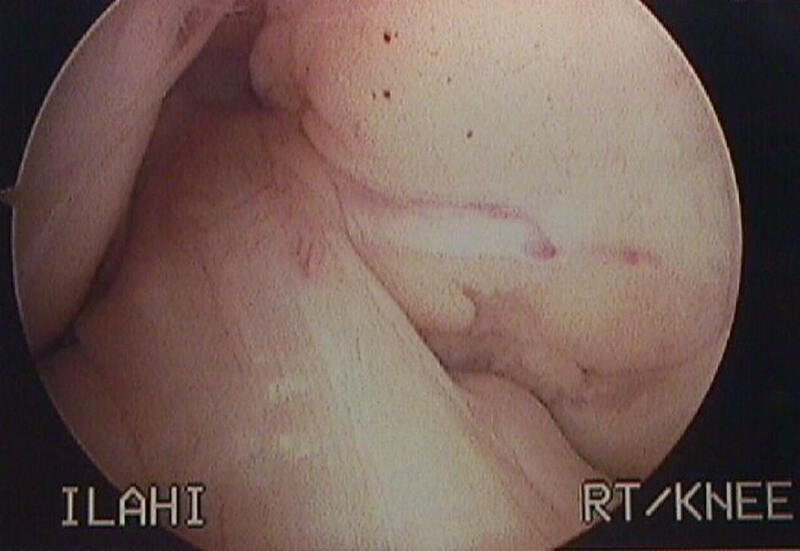 In contrast, the cruciate ligaments, being inside the joint, have very poor capacity to heal. Restoring function of torn cruciate ligaments therefore requires surgical intervention. Posterior cruciate ligament (PCL) injury is generally well tolerated by the knee. With appropriate rehabilitation, people can typically return to activity after an isolated posterior cruciate ligament injury. In fact, an estimated 2% of NFL players are playing on knees without posterior cruciate ligaments. A strong quadriceps muscles is thought to be able to take over some of the duties of the posterior cruciate ligament and thereby compensate for its absence or incompetence. As a result, most isolated PCL injuries can be successfully treated without surgery. In some severe cases, however, the PCL does require reconstruction to decrease severe laxity. In contrast to the PCL, anterior cruciate ligament (ACL) deficiency is less well compensated for by rehabilitation. Although one can restore motion and strength to the knee, the instability that results from ACL-deficiency limits one’s ability to do cutting, pivoting, twisting, and jumping-type activities. Straight-ahead activities like jogging or bicycling are typically unaffected. However, sports such as basketball, soccer, or football are usually not possible for patients with ACL-deficient knees. An analogy can be made of a four-wheel vehicle vs. a three-wheel vehicle. A four-wheel vehicle can take corners a lot faster than a three-wheel vehicle due to the inherent stability provided by four wheels. However, on a straight track, both vehicles may perform similarly. The ACL has such poor ability to heal, that even surgical repair of the torn ends of the injured ligament has not been very successful. In order to restore it’s function, this ligament must be reconstructed, which means replacing the torn ligament with tissue to act as a new ligament. Many synthetic grafts have been tried and have uniformly met with failure. However, a high degree of success has been achieved by the use of tendons to act as the new anterior cruciate ligament. Traditionally, a portion of the patellar tendon (which connects the kneecap to the tibia) is used. 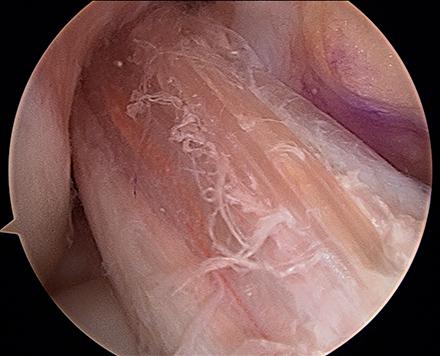 The central third of this tendon is taken along with a small piece of the kneecap and a small piece of the tibia. This is then put through drill holes in the top of the tibia and the end of the femur to take the place of the torn anterior cruciate ligament. More recently, techniques have been developed to take a couple of the small hamstring tendons from the medial (inside) aspect of the knee to act as a new ACL. Also, tendons from organ donors have also been used to reconstruct the ACL. All three methods have a high degree of success and each one has advantages and disadvantages. Discussing these options with a surgeon skilled in all these various techniques is the best way of deciding which graft source is the best choice for your knee. 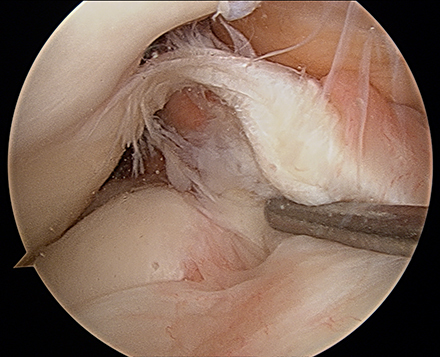 Arthroscopic picture of a normal ACL.